My previous job made me hurt my husband’s feelings everyday. Not intentionally, mind you, but after eight hours of having kids pinch me, pat my arm, jump on my back, hold on to my leg, sit in my lap, cover my eyes, cough on my lunch, play with my hair, sneeze in my face, make me pick up their poop and put it in the toilet, and poke me in a very uncomfortable spot (true story), I just didn’t need to have one more person touching me. I literally needed a “Don’t touch me” hour before I was human again and could resume shaking people’s hands and pulling down their skirts when they’re about to embarass themselves in front of an entire congregation. All day long, I was bombarded with questions and touching and more questions and I needed a daily “Sabbath” from human interaction to remain sane. In my opinion, life moves too quickly here in good ole’ America. We’ve lost the ability to just “be”. We rush around listening to our radios and our ipods. We never get off of our cell phones. We rush home from work so we can sit in front of the TV. There’s a severe lack of silence and time for reflection- almost a clinical obsession with distractions. We’re either too busy schlepping kids around to soccer practice and dance lessons or we’re too busy filling our day with mindless drivel that is in no way edifying or relaxing. Perhaps we’re trying to fill some internal void with noise and busyness. Perhaps we’re afraid to be alone with our thoughts because…who knows what we’re thinking? Eek! Perhaps all of this technology has made us so impatient that we can’t even slow down for one second. We literally get bored if we have two minutes of nothing to do. 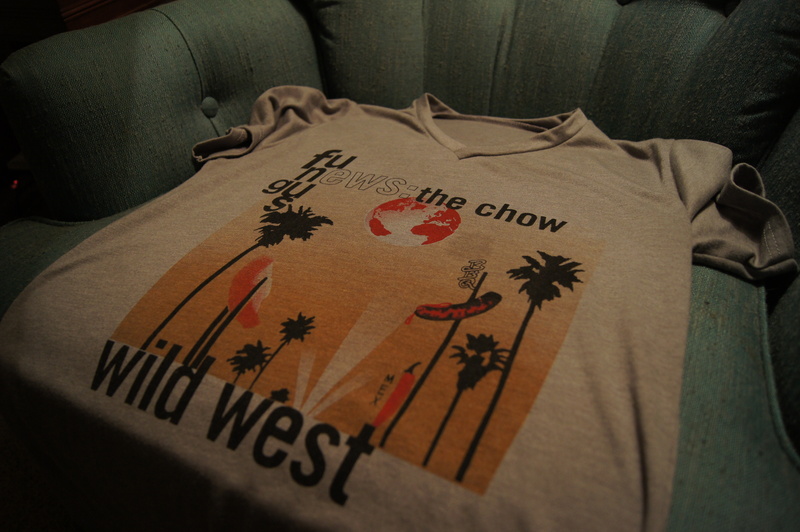 These are a few of my favorite things (all together on one shirt): giant sushi, the Wild West, palm trees, fungus, chiles from Mexico, space hot dogs, and news about "the chow". This shirt has too much going on. So much going on, in fact, that it makes literally no sense at all. There’s no purpose or direction to this shirt…which makes it an excellent t-shirt, but a not so good model for our lives. How can God speak to us if we have ear buds shoved in our ears all day? How can He tell us how much He loves us if we’re too busy texting about ABSOLUTELY NOTHING on our cell phones every waking moment? How can He teach me about perseverance if the only thing I persevere at is watching whatever Alex was watching last on TV because the remote is on the other couch? Yes, sometimes God appears to people in dreams or visions. Sometimes, He walks up behind you at the grocery store and asks you why you told that white lie to your boss (and why you need two jars of Nutella). But usually, at least in my life, God’s guidance and voice have been very quiet. Would I love to have a windy, fire-y earthquake of death to signal when God is going to speak to me? You bet. I think sometimes He whispers because He wants us to want to hear Him. If we really want to hear what God has to say, then we’ll choose to turn off the crap. The Creator of the Universe wants to whisper His love to us. Tags: jesus, t-shirt. Bookmark the permalink.